A weird chihuahua has appeared beside you. [Update] An Invader Zim comic from Oni Press is really happening in real life! Oni Press, Portland’s premier independent comic book publisher, announced today it is collaborating with Jhonen Vasquez and Nickelodeon in producing an ongoing comic book series based on the beloved animated show Invader Zim. 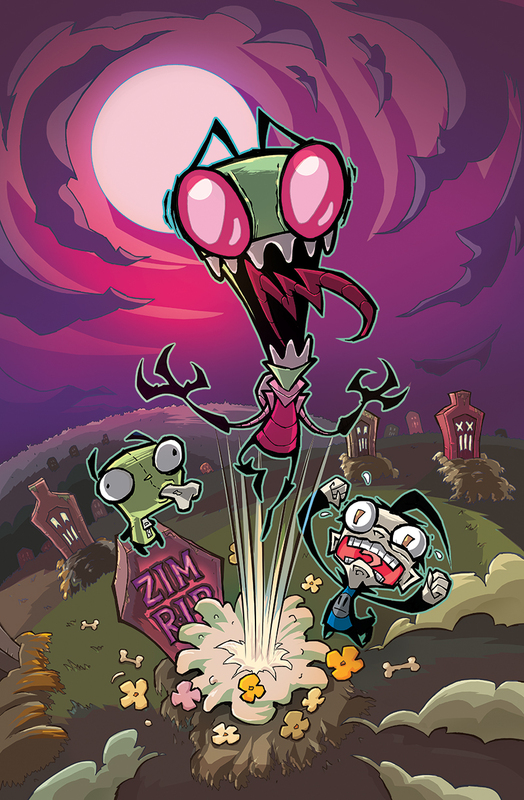 The series will explore a new chapter in Zim’s Earth invasion and the adventures of GIR, Dib and Gaz. The first comic will release on July 1st, 2015. Jhonen Vasquez, creator of the too-much-for-Nickelodeon series about an alien as tiny as he is megalomaniacal and whose incompetence is matched only by his human nemesis’ streak of bad luck, even retweeted it. But so far, we’ve got no other info forthcoming from Oni Press, publishers of Queen & Country, The Sixth Gun, and Scott Pilgrim. And Vasquez has joked (or perhaps trolled) about the future of Invader Zim before. So don’t count your headpigeons before they’ve hatched, but maybe think about breaking out that balogna you’ve been saving for a special occasion.